Most U.S. and Canadian made spas contain pumps made by several spa pump manufacturers including Waterway, Laing, Ultra Jet, Hayward, Pentair, Sta-rite and more. 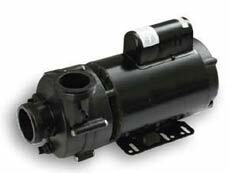 Spa pumps come in either 48 frame or 56 frame sizes. ELM carries all major pump brands and sizes. Spa pumps are made up of two main components: the pump motor which turns the impeller and the wet end which contains the impeller. The spa pump impeller in the wet end of the pump is turned by the pump motor and moves water through the system by centrifugal force. The impeller pulls water from the suctions and pushes water out of the pump discharge. ELM carries both 1-speed and 2-speed hot tub pumps in various HP and voltage configurations. 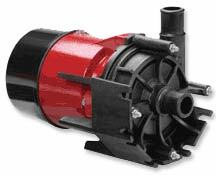 The Waterway Executive series of spa pumps offer different styles such as center discharge or side discharge. The wet end on these pumps can actually be rotated in 90 degree increments to accommodate various plumbing systems. ELM Sales and Equipment stocks replacement spa pumps for immediate shipping across Canada as well as a wide variety of pump spare parts and wet ends. Contact ELM to find the best replacement pump for your hot tub. Get the complete ELM Spa Product Catalogue. ELM stocks a wide variety of spa pump brands and models including Waterway Executive48, Waterway Executive56, Waterway Center Discharge, Waterway Viper, Waterway EX2, Waterway Tiny Might, Waterway Iron Might, Waterway Genesis, Waterway HI-FLO, Ultra Jet WOW, Vico WOW, Ultra Jet ULTIMAX, Ultra Jet Ultima, Vico Ultima, Laing SM-909, Laing SM-1212, Laing E10, Laing E14, Grundfos, Aqua-Flo Circ-Master, Aqua-Flo Flo-Master, Aqua-Flo XP2, Aqua-Flo XP2E, and Aqua-Flo XP3. Innovative hydraulic engineering makes a Starite-Pentair spa pump a reliable selection. These types of pumps are often found in swimming pools. Spa model pumps include the Dura-Jet pump, which is also available in a 50hz version. Other pumps that are available at ELM include Waterway Center Discharge, Waterway Executive 48, Waterway Executive 56, Waterway Viper, Waterway EX2, Waterway Hi-Flo, Waterway E-series, Waterway Tiny Might, Waterway Iron Might, Waterway Genesis, Ultra Jet Ultima, Ultra Jet Ultimax, Ultra Jet Wow, Sta-Rite Dura Jet, Aqua-Flo CMHP, Aqua-Flo FMHP, Aqua-Flo CMCP, Aqua-Flo FMCP, Aqua-Flo XP2, Aqua-Flo XP2E, Aqua-Flo XP3 and Hayward. Spa air blowers provide the bubbles that are delivered into the spa water through air channels or air injectors. Instead of just relying on venturi air from a jet to create more water flow, the air blower forces warm spa cabinet air through the spa water. A common cause of spa blower failure is moisture inside of a spa blower which can cause a short circuiting condition. Check valves and U-bends are utilized in the production of spas to prevent water from entering the spa blower. A leak near a pump is often caused by a bad pump seal. Pump seal kits are available for many different pump types, and contain all of the seals in the pump. Alternatively, there are also single pump shaft seals which can fix a leaky pump. Other hot tub pump parts include the drain plugs which are for draining water from the pump before winterizing the spa, anti-vibration pads, pump brackets and various pump accessories. See the ELM Sales and Equipment Catalogue for a complete selection of spa pumps and pump parts. ELM carries spa circ pumps including Waterway, Grundfos, Pentair and Laing. The well known Tiny Might circ pump by Waterway is used in many spas and is a 1/16HP, 1" in and out circulation pump available in either 120V or 240V configuration. ELM is the official Laing circulation pump distributor for several provinces in Canada including Ontario, Quebec and Eastern Canada. Some of our most popular models include the E10 series of Laing circ pumps. The SM 1212 series and the SM909 series have been discontinued but there are equivalent E-series model circulation pumps available. Contact the experts at ELM Sales and Equipment Inc. to find the correct replacement circ pump for your hot tub. ELM also carries a rotor repair kit which includes a rotor (also called an impeller) and an o-ring wet end seal. Rotor repair kits for both the SM and E10 series of Laing circulation pumps are available.